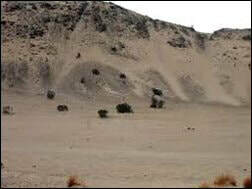 ​The legendary sand dune hill in Ocotillo Wells was originally formed by massive sand storms many years ago. It is fed with new sand from the sweeping winds across the desert, which in turn continuously reshapes and rebuilds the hill from riders during the year. As off-road vehicles climb the hill it makes a track with big whoops, a giant burm at the top, and a tighter burm at the base. Traffic on this hill can become dangerous, so please use caution and ensure you look for other riders at all times. During the New Year holiday Blow Sand lights up with excitement like no other place on the planet. Blow Sand is located approximately 2 miles from Desert Ironwoods Resort south to south-east, and 1 mile from the Ranger Station. Bring your best sand toys for a great climb, or if you got the guts and the power, give the sand hill face a try! 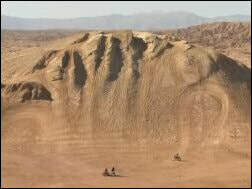 ​This 200 foot-high granite and sand island is named for the challenge it presents to the OHV enthusiast. It is actually an ancient decomposing mountain top. A dark coat of desert varnish covers the rocks as a result of exposure to sunlight. The hill is said to be haunted from old mineshafts found in the hill. This is a great off-road climbing training area for all levels of skill. From gentle sloping sand dunes on it’s south side to the narly mixed terrain vertical climbs which get progressively tougher as you move north up the hill. You can get to Devil’s Slide via the Shell Reef Expressway approx. 3 miles from Blow Sand south to south-east. Another fun way is going down San Felipe Wash to Devil’s Slide Lane. The one thing to watch is the bowl area where the sand dune meets the hill side. Many riders have had accidents here from other vehicles jumping the bowl. This is a great ride that literally takes you from Desert Ironwoods north to the other side of the Off-Road State Park south. You will get to see natural occurring hot springs and bubbling mud pools, with a wide range of terrain on the way there. Make sure to bring plenty of supplies and work out a time schedule that will put you back at camp before dark, especially with family on the ride. It is a semi-long ride and the last thing you want is to be stuck out in the open desert at night. From the Ironwoods Resort it is approx. 32-36 miles round trip. There are a couple of different ways to get to Gas Domes, but the general way is from Blow Sand to shell Reef on the Shell Reef Expressway. Continue on to Cross-Over Lane south to Gas Dome Trail and follow it approx. 1 mile to site. ​One of the favorite spots to visit in the Off-Road State Park. 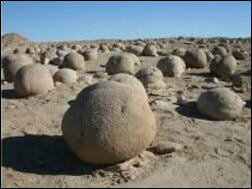 This unique landscape is the result of wind and water continuously eroding the surface soil and revealing globular sandstone concretions. It’s an adventurous ride from Desert Ironwoods that passes many great riding hot spots along the way. Depending on the groups riding level, you may need to plan routes that are young rider friendly. There are hills on the way that can have decent climbs in deep sand base. There are several ways to get to site, but the most common is from the Ranger station past Blow Sand to Shell Reef. At Shell Reef you head east on Cross Over Trail approx. 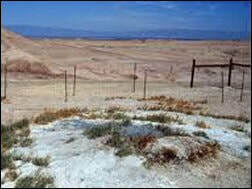 2 miles to Tule Wash. From there its another 2 miles north, and you have arrived. ​This is “The Hill” to prove your off-road skills. It is a very dangerous hill and suggested for only experienced riders in certain areas. If you do make it to the top, there can be some nasty surprises awaiting for you on the other side. 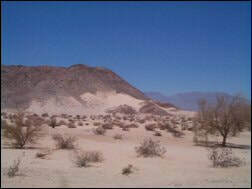 There have been more people air-lifted from this area than almost any other in the Ocotillo Wells Off-Road State Park. This miniature mountain range arose from the sea bed floor and is composed with rock, sand, dirt, and trillions on trillions of tiny sea shells and ancient aquatic life. Shell Reef is approx. 6 miles from the Ranger Station, straight down Shell Reef Expressway. Riders have been encouraged to find other hills in the name of conservation for the reef itself. And speaking from experience you might just conserve your flesh as well, but definitely a must see if you have never been to the desert before.